Ever imagined standing in the Douro valley, hearing not a sound except those of nature itself, savouring the great Oporto wine, while the stars shine above your head? Soon it will be possible. Miles Away, a Portuguese enterprise expert on providing experiences in the Côa and Douro valleys, offers you a wildlife safari camp, and even without lions, there will be a lot of wildlife to discover and enjoy in this wild region of Portugal! Mafalda Nicolau de Almeida, a genuine enthusiast of Western Iberia, Portugal. -“The region has such a striking landscape that it takes time to take it all in,” explains Mafalda Nicolau de Almeida with her eyes shining. Mafalda is a genuine enthusiast of Western Iberia. Native to Oporto, she spent most of her summer vacations in the Douro valley where her family has owned vineyards for centuries. The experience of living in the beautiful countryside of the Douro and Côa valleys was so intense that marked her life forever. After graduating in Arts in Oporto and realizing that this did not satisfy her ambitions, she returned to the region to work for an organisation that promoted the cultural heritage of the area. A few years ago she became aware of Associação Transumância e Natureeza (ATN), the regional partner of Rewilding Europe in the Western Iberia, and its work in creating opportunities for entrepreneurs to develop nature-based tourist experiences. Up to now, the tour operators working in the area provided only a brief glimpse of what the region had to offer, only “window tourism”, as Mafalda likes to call it. Drinking a few glasses of the delicious local Oporto wine and leaving the same day was not enough. 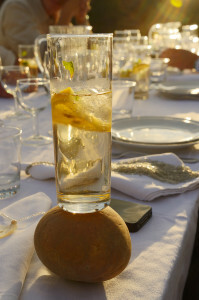 A fresh drink in the Côa valley. Mafalda decided to become an entrepreneur and Miles Away was born as an innovative travel agency, providing tailor-made tourist experiences in the Douro and Côa region. Her vacations are centred on authenticity and distinction: an elegant table at a never-imagined place, framed by a stunning natural landscape, a great selection of Douro wine, and tasteful local food. Offering an exploration of the senses is the ambition of Miles Away. There is a lot to be experienced: Paleolithic art engravings at the Côa Valley Archaeological Park, a world heritage UNESCO site, nature reserves to discover the wildlife of the region, and guided tours to the best winemakers, all led by local experts, affectionate people that can share their passion for the region. Mafalda, who is always developing new ideas and exploring new opportunities, is one the newest Rewilding Europe Capital loan beneficiaries. 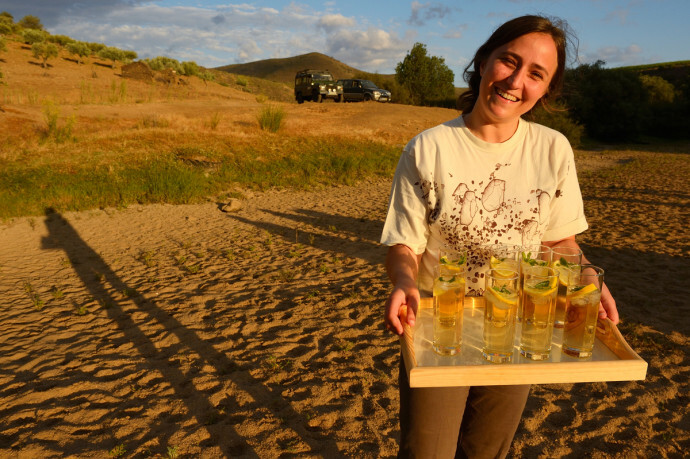 With the local support of ATN and the expertise of Rewilding Europe, Mafalda is now developing Fly Camp, a wildlife safari adventure where one can feel totally immersed in nature, sleeping in “a room without walls, only protected by a mosquito net” she says. The idea of Fly Camp is to provide a unique outdoor experience in the region, combining experiences in nature, beautiful landscapes and good-living. Visitors will sleep in a two-person “tent”, with a maximum of eight people per group. Soon Fly Camp will be officially launched and for the first location Mafalda has chosen Quinta do Monte Xisto, at Foz Côa, a wine estate with an astonishing view over the Douro river.